We are delighted to be hosting an online blogging event, one year after stepping into the blogosphere. It has always been an enriching and enjoyable experience to share our recipes through various events hosted by our blogger friends. The idea of hosting events piqued our interest and prompted us to creatively think for a theme. In a hunt for an innovative theme, we happened to listen to a radio program called "Lunch with Altu Phaltu" from which we adapted this concept for our event. Here we are with a theme for the first ever event to be hosted by us. We named it 'Design A Menu'. One of the common dilemmas we face everyday in our kitchens is to prepare a menu to satisfy our family members with a limited choice of ingredients on hand. So we thought it would be a good idea to get our brain juices flowing and go through this exercise of creating a menu with a handful of ingredients in our pantries. 1. 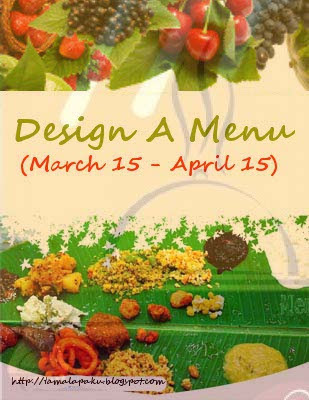 Design a sample menu using ALL the listed ingredients, cook and post one or more recipe(s) from the menu you have designed, between Mar 15th 2011 and Apr 15th 2011. (Make sure the menu is part of the post too). Looking forward to be flooded by your creative menus and entries. Nice idea. Seems like I have already posted the dessert recipes (that I know) using the ingredients above.:)Kidding. Will come up with something. Whata wonderful event and very different , will surely try and participate. Very interesting theme, happy hosting H&J.. Interesting theme and will try to participate. Cool. will send in my entries soon. Have updated my events page. Interesting event...Shall try to participate. Wonderful Event Harini!!!! can i send my basundi to the event!!! Wonderful theme Harini. Happy hosting will send my entry soon. That's an awesome event. Happy hosting! Thanks everyone for our response. @PriyaVaasu - The event is to design a menu with ALL the veggies, fruits and dals/flour/grains listed and post atleast one recipe from the menu you have designed and send it to us along with the menu details. So Basundi might not qualify as an entry as the star ingredient has to be from the ingredients listed in the details. (milk can be used but again has to be used along with the listed ingredients)..Hope I am clear. I love this idea! !I will certainly have a go at creating a menu!! Great idea..happy hosting dear ! Will send my entries.. Sounds good. Need to try how about bottle gourd halwa or does it have to be veg only? Please do collect you award from my place. first time visited..wonderful idea!! will sure try to participate...happy hosting!! hey Harini: Nice event ! Will try to participate and send in my entries soon ! Only question is : Do we need to cook and post all the 3 courses? Or just one from each category ? or just one or two? Happy Hosting and Happy Ugadi !